In colder climates, the primary objective may be to keep the heat inside rather than to keep the heat out like in warmer areas. If this is the case in your building then you will want to install WareHouseFoil™ closest to the inside of the building, after regular insulation, with the proper air space. This method is most effective at keeping heat inside the building so the building stays warmer with less energy. Keeping heat in a building using WareHouseFoil™ radiant barrier has been successfully achieved in barns, sheds, workshops, auto shops, and even in pet-rescue facilities. Whether you are heating the area with forced air (a central or localized heating unit) or by using direct radiant heat like a wood-burning stove, having the foil barrier closest to the inside works to prevent 97% of the radiant heat from inside the room(s) from escaping into the colder wall and roof areas. Remember: foil closest to the INSIDE of a building does the best job at keeping heat IN. WareHouseFoil™ must have an air space on one side of the foil to work properly. The “thermal envelope” (area being heated/cooled) should be as air tight as possible to prevent wasting energy and reducing the potential risk of moisture problems. When covering walls as shown in the three photos below, you can use our 48″ Wide Single Sided Radiant Barrier Foil with the foil side facing to the inside of the structure. How Does WareHouseFoil™ Help Retain Heat? How does this help reduce heat loss? Your heating system is putting heat into the building. More radiant is created with a radiant heating system compared to a forced air system. The radiant heat will heat up the interior of the building. By putting a dead air space behind the sheetrock, the heat will want to convert to a radiant form to “jump” across the airspace. Once it does this, the radiant heat meets the foil layer and is reflected back toward the interior. 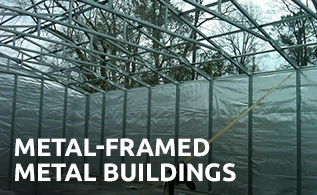 This prevents heat from escaping (less heat loss) and makes the outside layer of traditional insulation more effective. 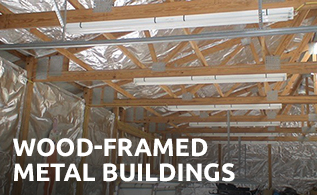 There are two common ways to install a radiant barrier to the interior of a building. The first is to leave the foil exposed and the second is to cover the foil with something like sheetrock or plywood. 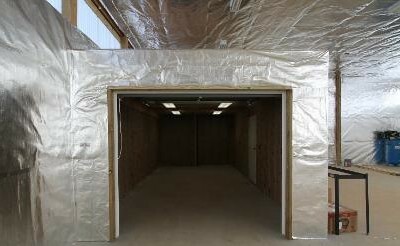 If you choose to cover the foil, you MUST leave an airspace (this is usually done with furring strips) between the final sheeting (plywood, sheetrock, etc.) and the foil; the air space should be a “dead” (sealed) air space that is not vented. When leaving the foil exposed to the interior space, the concept is basically the same for heat retention as it is for heat rejection. For exposed foil, the radiant heat from the interior hits the foil and is reflected back towards the interior and contents of the building. This is the most effective method to minimize radiant heat loss. If you prefer a more finished look* for the ceiling or walls, then go ahead and put the foil up, then run furring strips across the foil (horizontal or vertical – it doesn’t matter the direction) and then attach your interior layer. *Our WareHouseFoil™ with White Vinyl is an inexpensive alternative to sheetrock or plywood and it leaves the area with a nice, bright white appearance that is easy to clean. To use this product, attach the material after the furring strips (so the foil faces that air gap) with the foil facing the inside of the cavity/air space and the white side facing the interior of the building.